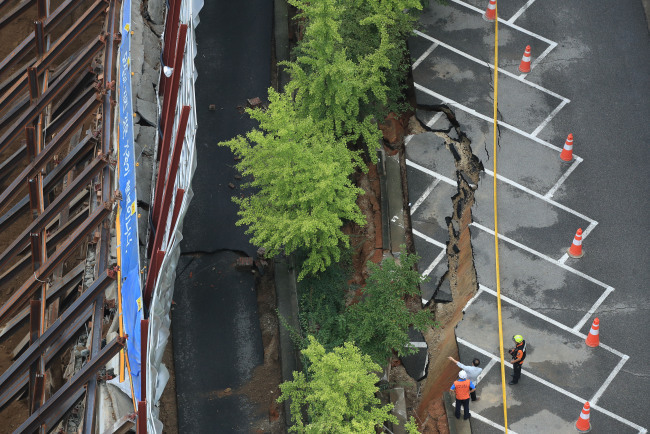 Hundreds of apartment residents who were evacuated after a large sinkhole appeared in the Geumcheon District in Seoul have refused to return to their homes amid concerns that their apartment buildings might collapse. When a parking area of an apartment complex in Gasan-dong partially sank Friday, some 200 people from 76 households were evacuated from their homes. The sinking of the land occurred as the embankment installed for a nearby construction site collapsed amid unprecedented downpours that recorded 148 millimeters of rain between Aug. 27 and Friday morning. After conducting safety inspections, the Geumcheon District Office on Sunday told residents it was safe to return to their apartments. It explained that the surrounding ground was stable and there was no problem with the apartment buildings, which are about 10 meters from the accident site. However, the residents have refused to return to their homes, expressing concerns and casting doubt on the inspections. Their worries over safety deepened as the state agency forecast about 50 to 100 mm of rain in Seoul from Monday to Tuesday. The city has designated a nearby middle school as an evacuation shelter, but most of the residents appear to be staying in hotels and other accommodations, with lodging expenses covered by Daewoo Engineering and Construction, which is building a commercial-residential property on the site next to the apartment complex. When an area about 30 meters by 10 meters sank some 6 meters around 4:30 a.m. Friday, the apartment buildings next to the construction site tilted about 5 degrees. Four cars parked in the area were damaged. “I looked out the window after a thunderous roar, to find the embankment covering the construction site collapsing with the land,” a 51-year-old resident told a Korean media outlet. The Korean Geotechnical Society is expected to complete a detailed inspection of the land and the apartment buildings by the end of next month. The Geumcheon District Office also plans to install instruments measuring ground subsidence at the scene for residents to see the measurements for themselves. A joint investigation by the local district office, Seoul Metropolitan Government and Ministry of Land, Infrastructure and Transport found no anomalies. Daewoo Engineering and Construction has been building a 30-floor office-residence building with three underground floors since January. On Sunday, the company issued an apology, admitting the accident was caused by the construction. It vowed to provide support to the nearby residents who were evacuated.